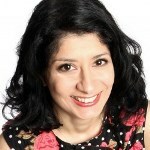 British-Iranian comedienne Shappi Khorsandi’s sharp wit and brand of deadpan humour makes her a perfect fit to host large events and awards shows. A consummate live performer Shappi has won acclaim wherever she has performed with a hilarious and versatile act that can move between the perils of single motherhood, to fleeing Iran as a result of her father’s satirical poetry. Shappi is a mainstay of British TV and radio having appeared on shows such as BBC’s QI, Have I Got News For You, Just a Minute and countless others. Shappi has hosted high level London awards events for Specialist Speakers.